The RallySport Mag team work closely with rally organizers to ensure their clients have access to the best spectator points, and get to see what goes on behind-the-scenes, like Service Park and Rally Headquarters visits. Your rally tour will be personally escorted by one of the RallySport Mag team. Our rally guides are committed to giving you the best rally experience. We look forward to welcoming you on one of our fully-escorted, value-for-money rally tours soon. 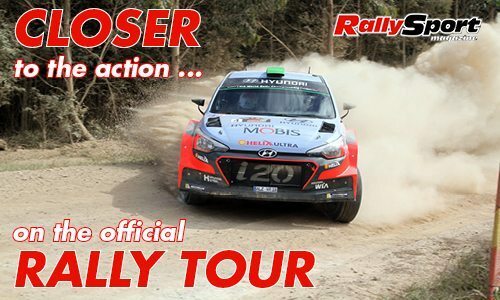 Kennards Hire Rally Australia is this year offering a bus service to spectators. Any spectators who don’t wish to drive to the event or have no means of transporting themselves to particular spectator points are invited to take advantage of the bus service. Buses are available at set times and destinations each day, and spectators are able to use the a single bus ticket as many times as they like each day. All tickets need to be pre-purchased via Ticketek prior to getting on the bus – no tickets can be purchased from the bus driver. Tickets are $27.50 for adults and children and need to be purchased for each day you intend on using the service – you’ll need to purchase three tickets if you intend on using the bus on Friday, Saturday, and Sunday. From the Box Seat to the Hot Seat! Tune in to see ARC competitor and 2016 Australian Rally Champion, Molly Taylor, talking all things rally on Channel 10’s RPM program this Sunday 21 April. Check local guides for times.